Over the past week of action for the Brooklyn Nets, there has been some steady improvement on offense in terms of ball movement and efficiency and it has translated into a couple of wins going 2-2 this past week. Let me tell you how it happened, last Friday the Nets traveled to Dallas to face the Mavs and lost a close one, 105-96. But without their star center brook Lopez, the Nets held their own. Also, in that game Nets rookie point guard Isaiah Whitehead had his best scoring game of the year dropping 24 points and only tallied one assist. Not the number you want to see from a point guard in your lineup, but nonetheless, Whitehead is improving game by game. The following game, Brooklyn hosted their cross-town rival Knicks on Notorious B.I.G night, as the Nets honored Brooklyn native and hip hop legend B.I.G, by hanging his name in the rafters. A great gesture by the Nets, as this day came on the 20th anniversary of his death and many of B.I.G’s close friends and family were in attendance along with plenty of celebrities. On the court, Brooklyn came away with the 120-112 victory led by Brook Lopez who controlled the paint for the better part of the game, tallying 25 points and 6 boards while Brooklyn won the rebound battle 63-53. The Nets also hit a franchise tying record 19 three pointers and with the win, it snapped Brooklyn’s 16 game losing streak at the Barclay’s Center. After the victory against the Knicks, the Nets hosted one of the hottest players in the league, triple double machine and MVP front runner Russell Westbrook. The game came in midst of the biggest snow storm of the year but both teams were hot out of the gate. But the Thunder proved to be a tough matchup for Brooklyn as OKC won the rebound battle 57-38 and the game, 122-104. The Nets didn’t have anybody that could matchup with Westbrook, as he tallied his 33rd triple double of the year with 25 points, 19 assists, and 12 rebounds. The effort put him one game closer to the NBA record of 41 triple doubles set by Oscar Robertson in the 1961-62 season. 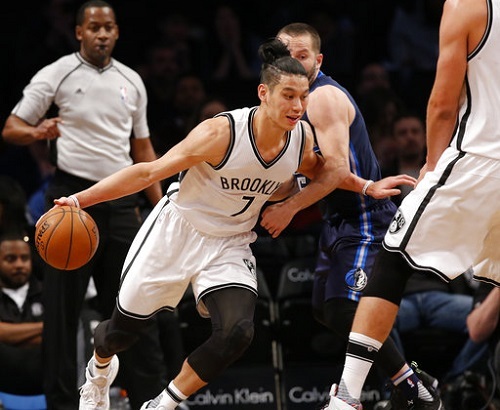 On the Nets side, Jeremy Lin and Brook Lopez lead the way in scoring with 24 from Lin and 25 from Lopez. But what continues to be a bright side for the Nets is the solid minutes and contribution from rookie and Sean Marks product Caris Levert, who has been shooting 53% from the field and 33% from deep in March and has continued to play great defense for Kenny Atkinson. The Nets ended the week with three game in four nights, as they traveled to Manhattan to face the Knicks again on Thursday, then hosted the Celtics on Friday, and the Mavericks on Sunday. The Nets would beat the Knicks 121-110 at the Garden, lead by Brook Lopez who tallied 24 points and 6 rebounds, but there was no time to celebrate the win as the second-best team in the Eastern Conference, the Boston Celtics, were awaiting the Nets at the Barclays. The Celtics were without their MVP candidate and 2nd leading scorer in the NBA, Isaiah Thomas. as he was nursing a bruised right knee but that wouldn’t phase Boston, as they ended winning a close one, 98-95. The Celtics outrebounded the Nets 51-41, proving to be the x factor in this one as well, as the dreadful shooting from Brooklyn who finished the game with a 36% field goal percentage. But after a solid week in which the Nets won two games against their rival Knicks, as well as putting up valiant efforts against playoff teams in the Thunder and the Celtics. The Nets then hosted the future hall of famer and recent 30,000 career point scorer Dirk Nowitzki and the Dallas Mavericks on Sunday for a matinee matchup. But to no delight to Nets fans and a sight that is far more common than pleasing, within the first 7 minutes of action, Jeremy Lin twisted his ankle forcing him to sit out for the remainder of the game and most likely a couple games. The Mavericks ended up winning the game 111-104 behind 23 points from Dirk. Leading the way for the Nets was Brook Lopez who totaled 27 points and 7 rebounds. So to recap the week, the Nets went 2-3 with the two wins coming against the Knicks and the 3 losses coming against teams in playoff contention. So, the Nets have a 13-56 record with about a month left in the season. The underlining story for the Nets this year has to be the fact that their starting point guard can’t stay on the court. Jeremy Lin has only played in 25 games this year dealing with a nagging hamstring injury that he suffered only a couple games into the season. Now he has a twisted ankle to deal with so it’s been a tough year for Lin to say the least after one of his best seasons as a pro last season in Charlotte. There is no doubt in my mind that if Lin is healthy for the better part of the season the Nets wouldn’t have the worst record in the league, but that doesn’t mean this is a playoff team either, as presently constructed. However, with Sean Marks at the helm, I would be extremely confident as a Nets fan that he will turn this team around and have them back in playoff contention sooner than later.